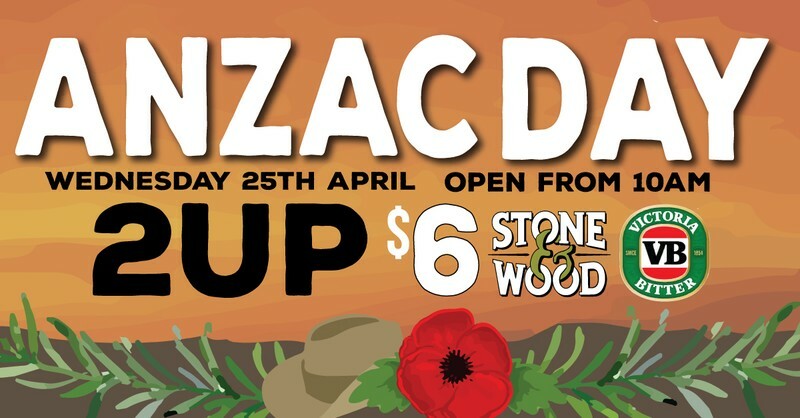 A time for all Australians to come together in commemoration and remembrance of the past and present servicemen & servicewomen of Australia and New Zealand, here at The DOG we've got plenty up our sleeves to make it a cracker of an ANZAC Day. Open from 10am, perfect for a comfortable retreat after the morning service & March. We've got chef specials galore, with Aussie Burgers, VB battered Fish'n'Chips & Calamari, Vegemite Pies & much more! Not forgotten, is the classic Anzac Day tradition (and perhaps duty) of Two-Up. Played to remember the diggers in the war, the games will be hosted from 12pm until sun-down hosted by the ever-engaging Ben Malouf from 2GB & 2UE. Stone & Wood Brewing, the well known and beloved Australian craft brewery will also be sponsoring a lucky door prize! More details and information can be found on our website!